Hundreds are scheduled to camp out along the track and field to raise money for the American Cancer Society and the fight against cancer. 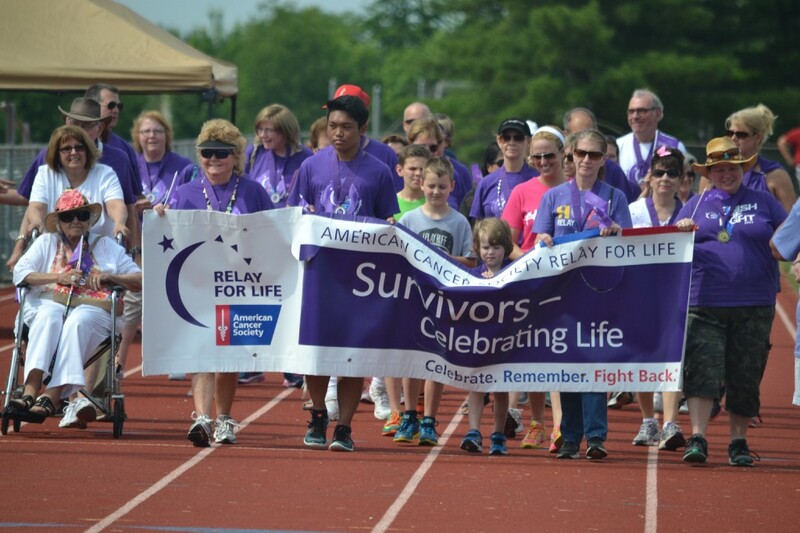 Photo by Zane Clark: Survivors walk during the 2016 Relay for Life of Medford-Mt. Laurel. Locals can once again mix fun with fundraising when the Relay for Life of Medford-Mt. Laurel returns to Lenape High School on June 3. Hundreds of locals are scheduled to camp out along the track and field at Lenape for an afternoon and night of walking, dancing, music, games and more, all to raise money for the American Cancer Society and the fight against cancer. Whether it’s groups of local kids from Shawnee, Lenape or Seneca high schools, bands of families and friends, or teams of business and work colleagues, the Relay for Life of Medford-Mt. Laurel gives locals the chance to honor cancer survivors and remember those who have succumbed to the disease. The history of Relay for Life can be traced back to the mid-1980s with a surgeon in Tacoma, Wash., who solicited donations for the American Cancer Society by walking around a local track for 24 hours. Since then, the American Cancer Society has spread Relay for Life events throughout the world, with supporters raising millions of dollars by holding their own similar events where volunteers and teams walk along tracks for hours at a time. Kathy Tyrrell, this year’s returning event chair for the Relay for Life of Medford-Mt. Laurel, describes Relay for Life as a way to turn negatives into positives. Tyrrell, who lost her father to cancer, joined her first Relay for Life event 15 years ago and never looked back. “I wanted to be able to contribute back. I think that would have been important to my father to contribute back and keep his memory going,” Tyrrell said. Tyrrell said Relay for Life allows her to meet cancer survivors each year and learn of the successes patients are having with new therapies. “I don’t think there’s anyone who hasn’t been touched by cancer. I think it’s a wonderful community event to celebrate our survivors and caregivers and raise money for the different divisions of the American Cancer Society,” Tyrrell said. Tyrrell said the Relay for Life of Medford-Mt. Laurel was one of the few remaining events in the area to continue the tradition of holding the event overnight. Even with the event less than a month away, Tyrrell said there’s still plenty of time to register and start fundraising. As of the beginning of May, 184 participants across 26 teams had already raised more than $41,000 toward the Relay for Life of Medford-Mt. Laurel’s goal of $105,000. The Relay for Life of Medford-Mt. Laurel returns to Lenape High School on June 3 starting at 3 p.m. and lasting overnight until 6 a.m.
For more information or to register for the event or to join a team, visit www.relayforlife.org/mtlaurelnj. “You have to register if you want to stay overnight, but anyone can come out to event for a few laps and see what it’s all about,” Tyrrell said. Newspaper Media Group, publisher of The Sun, is a presenting sponsor for this event.